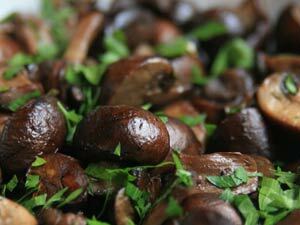 Toss mushrooms olive oil, salt, and pepper together in a bowl and toss to combine. Spread this evenly on a baking sheet coated with non-stick cooking spray. and roast for 30-35 minutes. In the meantime, pour a little leftover oil from the mushroom mixture into a small saucepan and heat over medium-low. Add the garlic and paprika and cook until the garlic browns. Top the mushrooms with the garlic mixture and garnish with parsely. This entry was posted in Metabolic Medical Center Recipes, Modified Profast (Fast and Flexible) Recipes, Nutriplus Recipes (Balance Your Pyramid), Uncategorized, Vegetables and tagged appetizer, button mushrooms, easy, fast, garlic, mushroom, one dish, Paprika, shitake mushrooms, side dish, Vegetable, vegetarian by foodies4mmc. Bookmark the permalink.